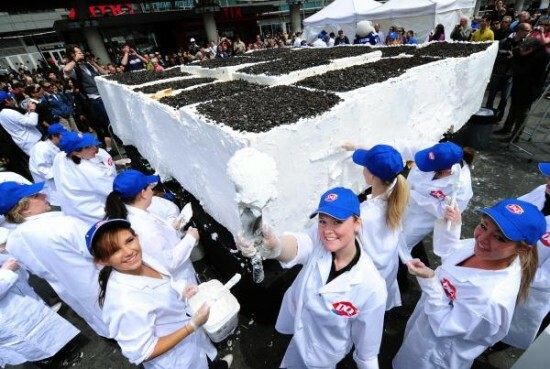 Yesterday, Canadian company Dairy Queen has set a new world record by making the world’s largest ice-cream cake in Yonge and Dundas Square, Toronto. 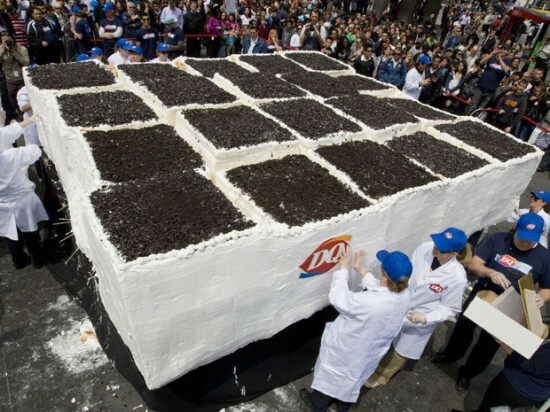 It took 100 people over a year to plan the event, but after 30 years and 52 million ice-cream cakes sold, this was the perfect way to celebrate, according to Denise Hutton, vice-president of marketing at Dairy Queen Canada. Dozens of chefs worked around the clock using over 9,000 kg of ice-cream, 91 kg of sponge cake, around 136 kg of icing and Oreo crumbles, to beat the former world record, a nearly 8,000 kg ice-cream cake made by China, in 2006. 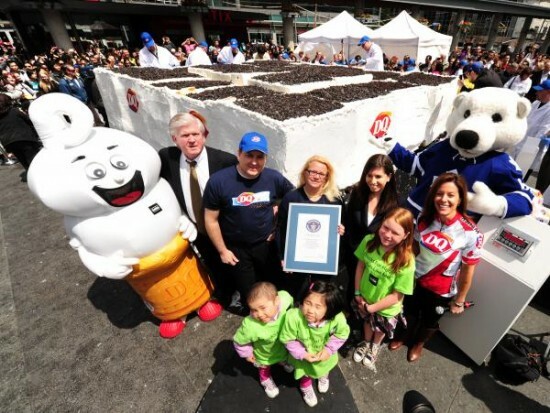 After the cake was completed and acknowledged by the Guinness Book of Records, pieces of it were served to the crowd gathered in Yonge and Dundas Square, with 100% of suggested donations going to Children’s Miracle Network. “When else can eating ice cream cake help to fund medical care, research and educational programs so that Canadian kids have access to world-class care? It’s the best of all worlds – a delicious treat and a great cause.” said the charity’s Paul Lethbridge.